Gamo Bone Collector 3" Color Coded .40 Cal. 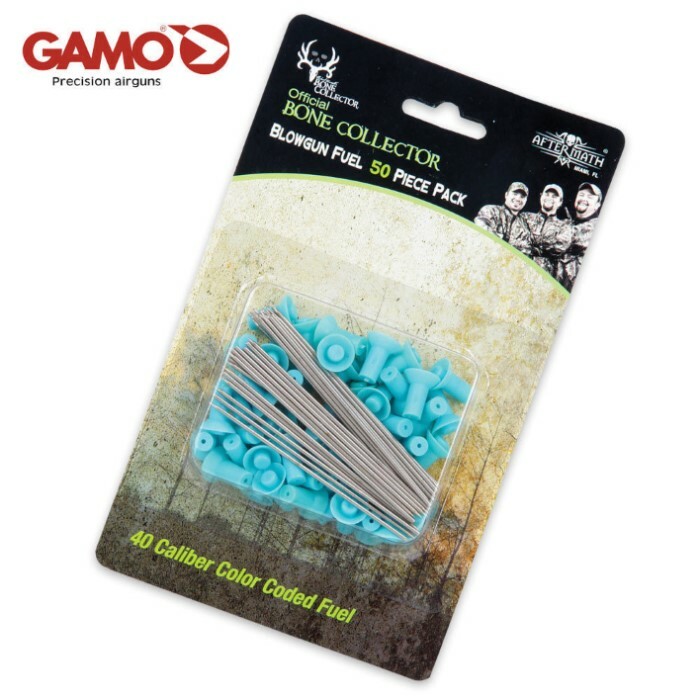 Blowgun Darts 50 Count Pack-Blue Keep the darts coming from your blowgun with these premium Gamo Bone Collector color-coded blowgun fuel darts. Each metal .40 caliber blowgun fuel dart has a 3" shaft with a sharpened tip for easy target penetration. The blue head makes it easy to color code your fuel darts. You can enjoy hours of blowgun fun with this 50-count pack. I like these darts. They are really sharp.I love these better than all of the other darts that you have.They stick really well,in most objects.I went and brought a 6'x3' board,mounted it in the back yard on a pole,and put different targets on it.I have 4different size blowguns and have a field day shooting all of them at the targets. Ronn''Manchu''Shaw.